It’s a brisk December morning on Mt. 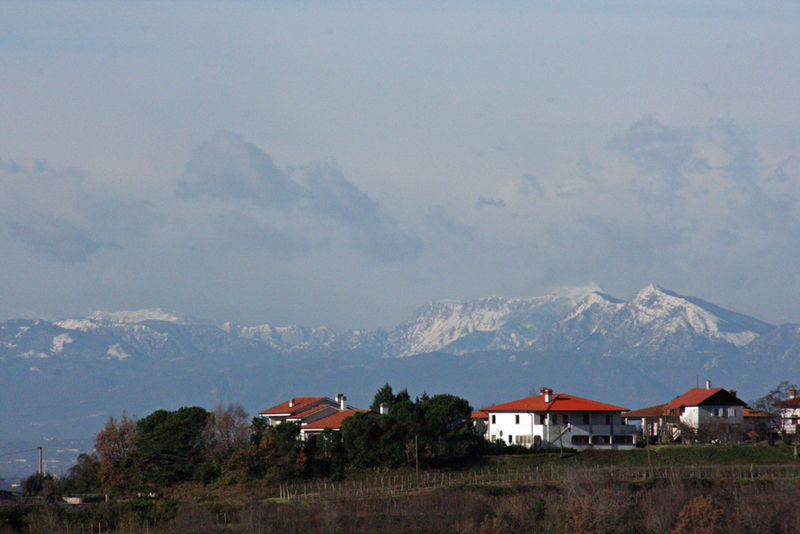 Sabotino, the tallest peak in the Collio wine region in Friuli. Whitewashed stone markers jut from the mountain’s spine like blades on a Stegosaurus, marking the border between Italy and Slovenia. 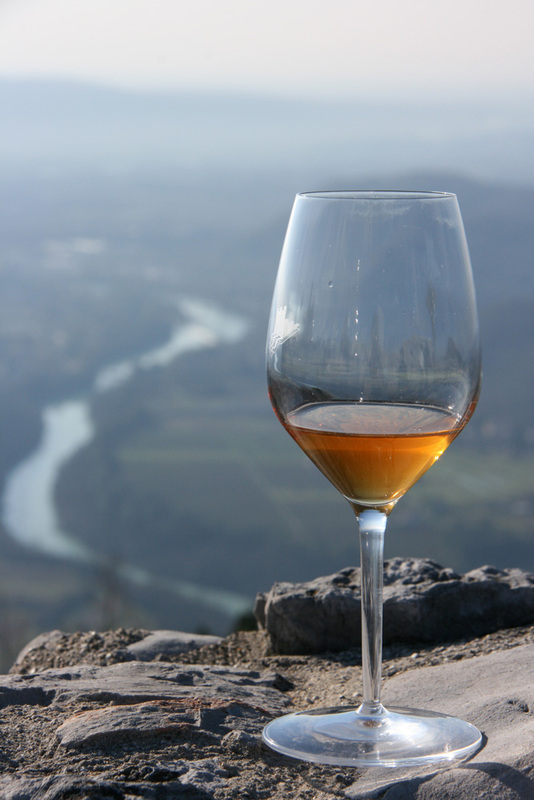 A man in a neon orange ski cap with the logo Associazione Produttori Ribolla di Oslavia hands me a glass of unfiltered wine that looks like apple cider—slightly hazy and the color of burnished copper. From our perch at 2,000 feet, I can see everything that matters to this wine: ahead, the shimmering Adriatic, which ensures a mellow climate; behind, the snow-capped Julian Alps, a line of defense against harsh northern winds; underfoot, the calcareous, marine-origin ponca soil, which supplies coveted minerality. On my cold cheeks, I feel the wind that ventilates the vineyards, a constant, diurnal pendulum of sea and mountain air, which keeps the wines crisp and aromatic and the grapes dry, healthy, and chemical-free. And standing before me in their merry orange hats are a half-dozen enological wizards, whose spirit of experimentation, devotion to terroir, and collective-mindedness are typical of the Collio. All together, these elements have pushed the Collio to the top of the charts. Collio means hill, and Italy has lots of them, so it’s no wonder that colli (plural) shows up in the names of 43 DOC and 6 DOCG wines, from Rome’s Colli Albani to Alto Adige’s Colli di Bolzano. But there’s only one Collio plain and simple, and that’s this region, a croissant-shaped ring of hills abutting Gorizia that in 1968 became one of Italy’s early Denominazione di Origine Controllata zones. Never heard of it? It is tiny, covering only 1,600 hectares and making just 0.2 percent of Italy’s wine. But its unique microclimate has made the Collio a go-to spot for quality wine for centuries. Before being annexed to Italy in 1918, the Collio was part of the Austro-Hungarian Empire, and the Imperial Habsburg court routinely turned to this southernmost territory—their warmest—to supply their finest wine. After World War I, the wine zone was split in two. The Italians named their part Collio Goriziano (shortened to Collio when it became a DOC); the Slavs called their significantly larger portion Brda (BIRD-dah). Despite years with an Iron Curtain, the border zone today is culturally porous, the national boundary more of an annoyance than an actual divide in mentality, language, or viticulture. Roman, Austrian, Slavic, Italian: Perhaps it’s these fluctuating identities that have led to two characteristics among Collio winemakers: their fidelity to terroir, to their land and soil, no matter which political flag waves overhead; and their willingness to experiment, to try on different viticultural identities. What kind of wine can you expect to find here? The short answer is white, some 85 percent of production. Many whites we associate with the Collio—sauvignon blanc, pinot grigio, pinot bianco, chardonnay—are French varietals that first arrived in the late 1800s, brought by a French count, Théodore de La Tour, after he married an Austrian and settled in the Villa Russiz near Capriva. He was the first to intuit that the Collio’s climate was a good match for French varietals (and boy was he right; Villa Russiz’s Sauvignon de La Tour, $30, still knocks it out of the park). Other whites are native to Friuli, such as tocai (now called friulano), picolit, and malvasia istriana. Then there’s ribolla gialla. This fat, yellow-gold grape holds a special place in the heart of Collio winemakers, being the only varietal born on local turf, coming from Oslavia on the slopes of Mt. Sabotino. Despite de La Tour’s pioneering work, wine didn’t get commercialized in the Collio until after World War II. It took its great leap forward in the 1960s, when local legend Mario Schiopetto introduced German technology—specifically cold-temperature fermentation—into Italy. Temperature control is particularly important for whites, as it allows their delicate aromas to survive the fermentation process and its natural byproduct— heat—which wreaks havoc on bouquet. Schiopetto kicked off a style that remains closely associated with the Collio: monovarietal wines that are pure, laser-precise expressions of the grape. A third style that’s gaining ground also takes its cue from the past, when whites and reds were treated similarly in the cellar. This style was on display at the al fresco tasting on Mt. Sabotino organized by the new Associazione Produttori Ribolla di Oslavia. Others in the association might not be so extreme. La Castellada macerates their ribolla for 15 days, Il Carpino and Princic for seven, and Primosic and Fiegl for one, so their wines range from copper-orange to lustrous pale gold. And no one approaches the radicalism of Josko Gravner, their neighbor who was the first to fixate on ribolla and now uses noninterventionist techniques drawn from antiquity, like fermenting in amphorae lined with beeswax. But all are trying to coax the best from this difficult grape, which is high in acidity, low in aromatics and alcohol, and slow to ripen, but is nonetheless their heritage. To sample the purest expressions of this Oslavian grape, try the gloriously fresh and focused Ribolla from La Castellada, $65, and Primosic (Reserve, $58; regular, $30). Then round out your Collio half-case sampler with two monovarietals and two blends, such as Russiz Superiore Collio Pinot Bianco, $21, and Venica Sauvignon Ronco delle Mele, $35; plus Zuani “Zuani Vigne” Collio Bianco, $22, and Marco Felluga Collio Molamatta, $21. Or simply head to your wine shop, find the Collio section, and grab a few bottles. Chances are, they’ll put this borderland on your radar henceforth. Published in the May/June 2010 issue of Tastes of Italia magazine.